CANBERRA, Australia — President Donald Trump has branded an Obama administration deal that would allow mostly Muslim refugees rejected by Australia to be resettled in the U.S. as "dumb" and vowed to review it. 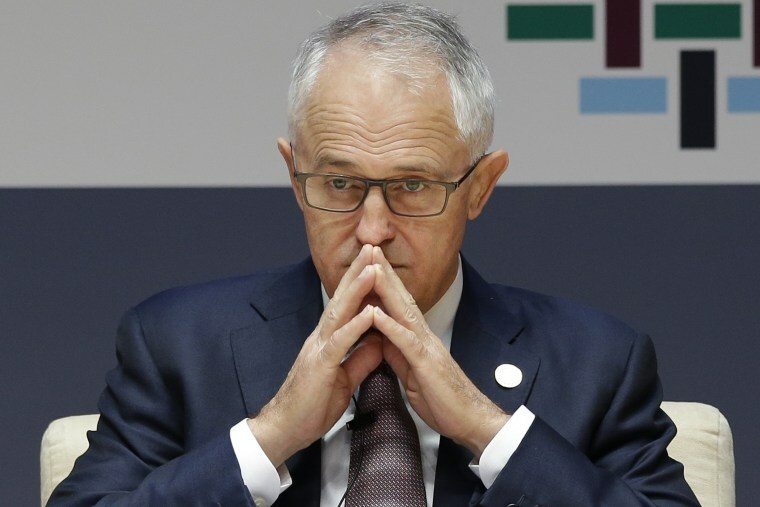 Australian Prime Minister Malcolm Turnbull insisted Thursday that the agreement was still on. However, he declined to comment on his first telephone call with Trump as national leaders. "It's better that these things — these conversations — are conducted candidly, frankly, privately," Turnbull told reporters. Later, however, he denied during an interview with Sydney radio station 2GB that Trump had hung up on him, saying the conversation had ended "courteously." A senior Trump administration official told NBC News that Saturday's call lasted around 25 minutes but pushed back on reports that it had involved yelling. However, the source acknowledged that Trump's tone during the conversation had been "blunt." Turnbull told reporters the strength of the relationship between the two nations was evident in that Trump had agreed to honor the deal to resettle refugees from among around 1,600 asylum seekers, most of whom are on island camps on the Pacific nations of Nauru and Papua New Guinea. Australia has refused to accept them and instead pays for them to be housed on the impoverished islands. Yet shortly after Turnbull made those comments to reporters, Trump took to Twitter to slam the deal. Many of those being held in the Australian detention centers, which have drawn harsh criticism from the United Nations and rights groups, have fled violence in countries such as Afghanistan, Iraq and Iran. A day before the conversation with Turnbull, Trump had signed an executive order suspending the admission of refugees. There have been mixed messages from Washington all week on the state of the agreement with Australia. White House spokesman Sean Spicer confirmed on Wednesday that Trump had agreed to honor the deal. But a White House statement sent to Australian Broadcasting Corp. on Thursday said: "The president is still considering whether or not he will move forward with this deal at this time." The State Department said in a statement later Thursday that the United States would honor the agreement "out of respect for close ties to our Australian ally and friend." Turnbull has likened himself to Trump in that both are wealthy businessmen who came to politics late in life. Turnbull also has a reputation for blunt conversation and tough negotiations behind closed doors. Turnbull has resisted pressure this week to join other Western leaders in condemning Trump's temporary ban of immigrants from seven Muslim-majority countries. Rifts in ties are rare between the two staunch allies. The United States also plans to send extra military aircraft to Australia's tropical north this year as part of a U.S. Marines deployment that will bolster its military presence close to the disputed South China Sea. Australia is also one of 10 U.S. allies purchasing Lockheed Martin's F-35 fighter jet program. The Associated Press and Hallie Jackson contributed.